As a homeowner in Northern Virginia, your work is never done. There is always something to fix, some chore that needs to be done, or some project that needs completing. Being a homeowner is a full-time job. Unfortunately, you do not have 40 hours a week to dedicate to your house, because you actually have a real full-time job. So it is important to maximize your time. Don’t pick a home improvement project that just improves curb appeal; choose a project that improves your home’s curb appeal, functionality, and value. But what? How about a new fence? The right fence can really make your home stand out from the crowd, while also boosting your home’s value. That is what we like to call a win-win. Now the only difficult decision you have to make is which type of fence to install. We have already told you about the Benefits of Chain Link Fences and the Benefits of Wood Fences. This week we are going to focus on the Benefits of Vinyl Fences. Aesthetic Appeal: Quite simply, vinyl fences look great. These incredibly attractive fences, no matter the style you choose, will give your home an instant boost in curb appeal. 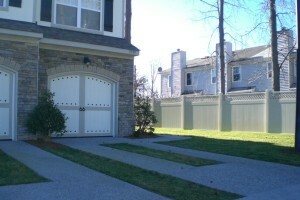 Low Maintenance: We know what you are thinking; wood fences are incredibly attractive, as well. But vinyl fences are also low maintenance. Unlike wood fences, these fences never need to be painted or stained. You get all of the benefits of a wood fence without the constant maintenance. Durability and Flexibility: Vinyl fences are built to last. In fact, vinyl fences are nearly five times stronger than wood. These fences are also flexible, making them perfect for areas with severe weather and high winds. Affordability: Best of all, vinyl fences are more affordable than most homeowners realize, especially when you consider how much you save in maintenance over your fence’s lifetime. Vinyl fencing has become very popular because of its clean appearance and long product life with minimal maintenance. Since 1955, Hercules Fence, the largest fence company based in Virginia, has been providing professional service and quality installation for both commercial and residential fences throughout Northern Virginia. We pride ourselves in installing high quality fences at affordable prices. If you have any questions about the Benefits of Vinyl Fences, please contact Hercules Fence of Northern Virginia today by calling (703)551-2609 or visiting our website. Also, check out Hercules Fence of Manassas on Facebook,Twitter, Google+ and YouTube! This entry was posted on Friday, September 20th, 2013 at 1:38 pm. Both comments and pings are currently closed.